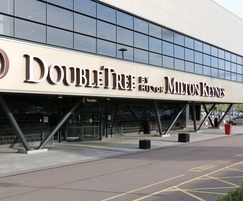 Hotel MK is a Hilton-branded hotel built into Stadium MK, home of MK Dons FC and a 2015 Rugby World Cup venue. It has 304 bedrooms as well as multiple event spaces. Its conference space regularly accommodates up to 700 people for banquets, 1,000 for conferences and up to 2,500 on match day. Consequently the urinals in the conference area can experience very high usage. The hotel operates under the Hilton brand and so must comply with Hilton’s brand standards. It also takes part in Hilton’s Lightstay programme, designed to reduce energy and water usage throughout the Hilton portfolio. Waterless urinals were already in use in the Stadium, so when the toilets in the conference areas needed to be refurbished, the hotel was keen to reduce its water usage further by installing them in these areas too. EcoProd Technique supplied URIMAT waterless urinals for the project. The installation was done by the hotel’s in-house team of builders and joiners in conjunction with external plumbing contractors and took only a few days to complete. Waterless urinals offered several benefits to the hotel. The conference area is not used every day so moving to waterless urinals means no water is used on the days that the conference area is not used. The hotel also needed to ensure that the installation fitted with Hilton’s brand standards for design. Waterless urinals offer an aesthetic advantage as the waste from them simply runs directly into the drains, eliminating the need for ugly pipes on show or any need to box pipes in. Draining into a wide pipe, rather than a narrow pipe as is the case with traditional urinals, also means that waterless urinals are highly unlikely ever to block. "I searched online for waterless urinals but none of the ones I looked at were particularly nice looking and it was very important to us to get something that fitted with the overall look of the facility and with Hilton’s own brand standards. When I came across Ecoprod I felt that their products were much more attractive and fitted with the clean look we wanted to achieve. They ticked all the boxes for us. The key selling points were the fact that the urinals were eco-friendly and the aesthetics of their design – that’s what sold me. I liaised with Edward at Ecoprod and together we agreed a plan and a delivery date. Everything went very smoothly. The products were all delivered on time. We arranged a split delivery so that one set of urinals could be installed while a second set remained in use. It’s a very modern-looking facility – we’re very happy with the results – it feels fresh and modern."